Macedonia is used as an adjective through the author's term for Alexander the Great, Alexandr Macedonský. Macedonia was an ancient kingdom with its origin in the northern part of the Greek peninsula. During the reign of Philip II of Macedon and his son Alexander the Great it became an enormous empire, stretching all the way to the river Indus. 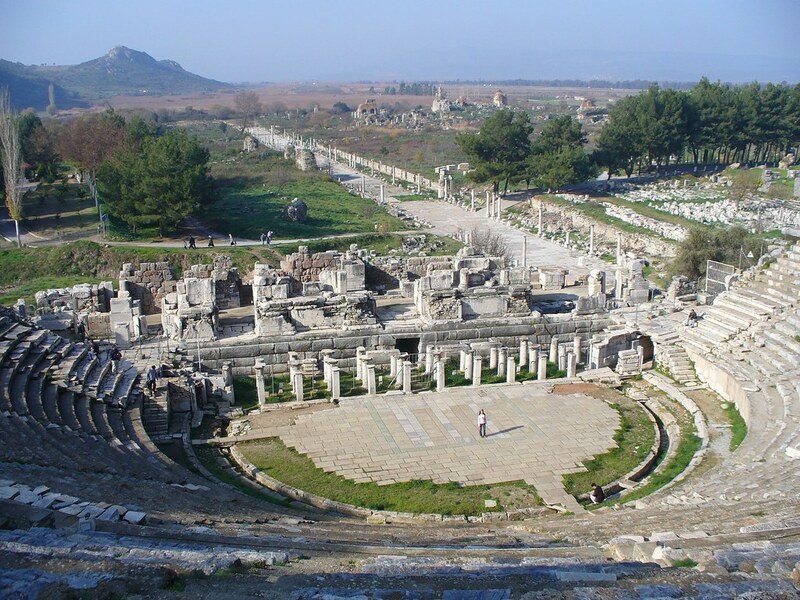 The capital at the time (400 BC to 300 BC) was Pella. Macedonia is the first of more than eight hundred geographical reference in the novel, and it appears already in the third sentence! [Úvod] Velká doba žádá velké lidi. Jsou nepoznaní hrdinové, skromní, bez slávy a historie Napoleona. Rozbor jejich povahy zastínil by slávu Alexandra Macedonského. Dnes můžete potkat v pražských ulicích ošumělého muže, který sám ani neví, co vlastně znamená v historii nové velké doby. Vltava and Hradčany seen from Jiráskův most. Prague is mentioned already in the introduction, and later on the action of the entire first part of the novel takes place in the home city of Švejk. The author knew Prague extremely well, and he refers to nearly 140 places in the city during the novel. The action takes place in the districts of Nové Město, Staré Město, Malá Strana and Hradčany. The principal area is Nové Město where it all starts. Švejk probably lived very close to the street Na Bojišti in Nové Město. The plot also strays into suburbs that in 1922 became part of Greater Prague: Karlín, Vršovice, Žižkov, Motol, and Břevnov. Švejk also sets many of his innumerable stories in Prague and adjoining suburbs. Prague is the capital and largest city in the Czech Republic. It is located on the river Vltava and the population is about 1.2 million. After 1648 Prague has been little exposed to warfare and as a result the old city centre is very well preserved. The city can thus offer intact architecture from several eras and is considered one of the most beautiful in Europe. The inner city area has since 1992 been on UNESCO's World Heritage List. Prague was already in the Middle Ages an important city and reached its summit during the reign of Charles IV, who was also Holy Roman emperor. After Bohemia came under Habsburg rule from 1526 onwards, it gradually lost its importance and was by the outbreak of WW1 reduced to being one of several Austrian regional capitals. In 1914 the city was much smaller than today, consisting of the districts I. Staré Město, II. Nové Město, III. Malá Strana, IV. Hradčany, V. Josefov, VI. Vyšehrad, VII. Holešovice-Bubny and VIII. Libeň. The city was officially called Královské hlavní město Praha (Royal Capital Prague). The numbering of the districts also differed from today; Malá Strana, for instance, was Prague III whereas it is now part of Praha I. The population count in 1910 was appx. 224,000, with suburbs included 476,000. 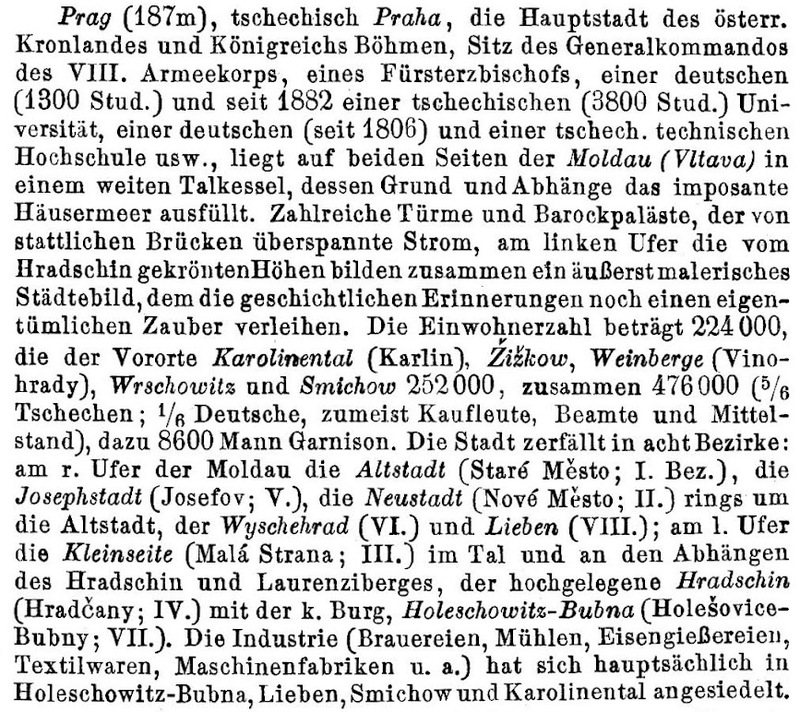 More than 90 per cent were of Czech nationality, the rest predominantly German (including Jews). The city was also seat of Generalkommando des VIII. Armeekorps, the unit IR91 belonged to. In 1922 several adjoining districts were incorporated into the new Czechoslovak capital. The new administrative unit became known as Velká Praha. Jaroslav Hašek was born in Školská 16 in Praha II., 30 April 1883. He lived in Prague and the nearby districts of Královské Vinohrady and Smíchov until February 1915. From 19 December 1920 to 25 August 1921 he also resides in the city, although mostly in Žižkov which was still to become part of the capital. Part one and the beginning of part two of The Good Soldier Švejk were written here from March to August 1921. [Úvod] Dnes můžete potkat v pražských ulicích ošumělého muže, který sám ani neví, co vlastně znamená v historii nové velké doby. Austria shown in red, Hungary in grey. Austria is briefly mentioned in the introduction, but plays a key role throughout the novel and is mentioned many times. The Dual Monarchy, Austria-Hungary, is the main target of Jaroslav Hašek's satire. The author often uses the term Austria even when referring to the entire monarchy. The bulk of the novel takes place on Austrian territory: part one, half of part two, the final chapter of part three and all of part four. The rest of the plot is set in the Hungarian part of the empire. Austria was the political entity that ruled Bohemia from 1526 to 1918. From 1804 to 1867 the term applied to the entire Habsburg empire, but after the "Ausgleich" in 1867 it applied only to the Austrian part of what had now become Austria-Hungary. Vienna was capital throughout both periods. A much used unofficial term for Austria from 1867 to 1918 was Cisleithanien. The official name until 1915 was Die im Reichsrat vertretenen Königreiche und Länder, from 1915 again Österreich. The latest name change took place despite strong protests from the Czech deputies in the Reichsrat. The area was officially an empire and Franz Joseph I. was emperor until his death in 1916. The result of the defeat in WW1 was the empire's disintegration; the area was split between the new republic of Austria, Czechoslovakia, Yugoslavia, Poland, Italy and Romania. [Úvod] A tento tichý, skromný, ošumělý muž jest opravdu ten starý dobrý voják Švejk, hrdinný, statečný, který kdysi za Rakouska byl v ústech všech občanů Českého království a jehož sláva nezapadne ani v republice. Kingdom of Bohemia is just about mentioned in the introduction but plays otherwise a minor role, at least when it comes to direct references. Still a substantial part of the plot and almost all the anecdotes take place on the territory of the former kingdom. Kingdom of Bohemia was a historical kingdom that existed from 1198, and from 1526 to 1918 it was a political entity (crown land) ruled by the Habsburg Empire. Some of the Habsburg emperors were also crowned as kings of Bohemia. Franz Joseph I refused coronation and this caused a great deal of resentment amongst Czechs. The emperor's executive in the kingdom was the "Statthalter" (governor) who held residence in Prague. The official languages were Czech and German. The kingdom was dissolved in 1918 and it's territory became the most influental region in the newly proclaimed Czechoslovakia. Czechoslovakia is indirectly mentioned by the author through the term "The Republic". Later on there are several references, particularly in bitter outbursts against people who had worked for the Austrian oppressors and now lived comfortably in the new republic. See Slavíček and Klíma. Czechoslovakia was a historic state in Central Europe. It was established on 28 October 1918 as a consequence of the collapse of Austria-Hungary at the end of WW1. Czechoslovakia consisted the regions of Bohemia, Moravia, Slovakia, Carpathian Ruthenia, and a small part of Silesia. Until the Munich agreement destroyed the state in 1938, Tsjekkoslovakia was a highly developed democracy with a strong industrial base. After the defeat of the Nazis, Czechoslovakia was restored with a democratic government, but in February 1948 the communists took power in a coup and a one-party state was established. In 1989 democracy was restored, but the state was split in the Czech Republic and Slovakia 1 January 1993. This was one of the world's few peaceful political divorces. [1.14.2] Dnes jsou důstojničtí sluhové roztroušeni po celé naší republice a vypravují o svých hrdinných skutcích. Ephesus is mentioned in connection with Herostratus, the vain fool who here gets compared to Švejk and stated to be his complete opposite. The terms "herostratic fame" refers to Herostratos setting fire to the temple in Ephesus to achieve fame. Ephesus was in ancient times an important port on the western coast of Asia Minor with around 250,000 inhabitants. The city was Ioanian Greece's economic centre and later one of the most important cities of the Roman Empire. The city housed one of the seven wonders of the worlds; the Temple of Artemis. [Úvod] On nezapálil chrám bohyně v Efesu, jako to udělal ten hlupák Herostrates, aby se dostal do novin a školních čítanek.